TNT er klar med en TV mini-serie, som absolut lyder spændende, specielt pga producenterne, et par udmærkede skuespillere og nogle danskere. Serien hedder "The Company", er bl.a. produceret af Ridley & Tony Scott. Og ikke mindst instrueret af danske Mikael Salomon! På skuespiller listen er bl.a. Chris O?Donnell, Alfred Molina, Michael Keaton, Tom Hollander og Ulrich Thomsen. Serien er i tre dele, ca. 6 timer i alt. In a time when it was us against them, sometimes it was hard to tell the good guys from the bad. 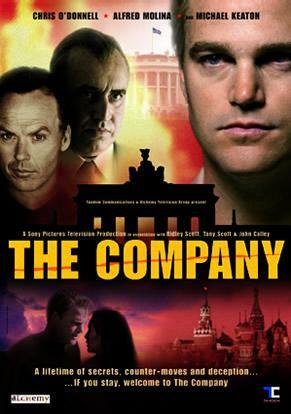 The Company is an action-packed thriller that traces the activities of the CIA's underground fight with the KGB, spanning the globe from Moscow to Berlin, from Budapest to London, from Washington, DC to Cuba. It's the thrilling story of Jack McCauliffe, a young, smart, idealistic Yale graduate recruited into the CIA by his athletics coach. Still wet behind the ears, Jack is sent to the legendary Berlin Base in Germany to work with a man who becomes his mentor: the eccentric and colorful Harvey Torriti ? codename "The Sorcerer". Jack and The Sorcerer are imprisoned in double lives, fighting an amoral, elusive, but formidable enemy ? in an unrelenting and deadly battle within the CIA itself. Download Torrent via MiniNova.org her. Anmeldelse i New York Times.